Free Shipping Included! 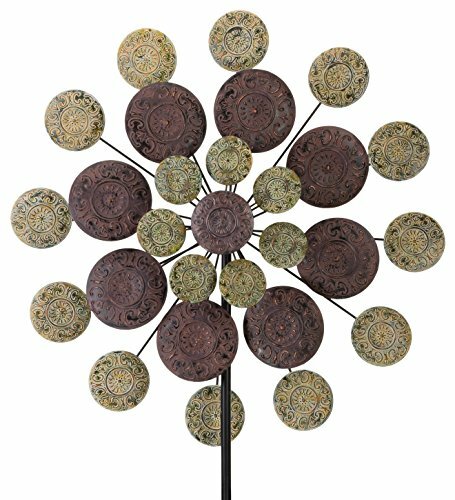 Regal Art & Gift Kinetic 32 inches x 9.5 inches x 85 inches Stake - Sage Medallion Garden Stakes by Regal Art & Gift at Heirloom Gardens. Hurry! Limited time offer. Offer valid only while supplies last. Bring excitement to gardens with Regal's largest Kinetic Stakes. Triple-bladed designs spin in opposite directions creating a wonderful effect. Bring excitement to gardens with Regal's largest Kinetic Stakes. Triple-bladed designs spin in opposite directions creating a wonderful effect. Handcrafted designs are painted in vibrant metallic colors that dazzle as they spin! Available in five styles: Sage Medallion, Starflower, Maha Rasa, Infinity and Galaxy. Display stand sold separately.